Greetings and salutations, everyone; yes, once again it is I, Mani the purebred border collie, filling in for the guy I live with, and here to bring you the latest news from our garden. You may remember me from such posts as “You Know, Because Raccoon”, among so many, many others. Here I am in a characteristic pose. I think you might also like this picture of me, with the morning light streaming in the upstairs bedroom window. The guy I live with says I look “rather coy”, which I think is acceptable. Anyway, it’s been pretty dry here, though right now it smells like rain outside. That’s because it is raining, a little. The guy I live with says he would not mind living in a climate where it rains, and that rain is much, much nicer than snow (I might not agree), especially when it’s rain without hail and tornadoes (that part I can agree with). So, as I mentioned last time, the guy I live with has been watering. No, the world isn’t coming to an end; he just decided to do some watering, to help coax the autumn-flowering bulbs, a bit. This is one result. And here’s another. 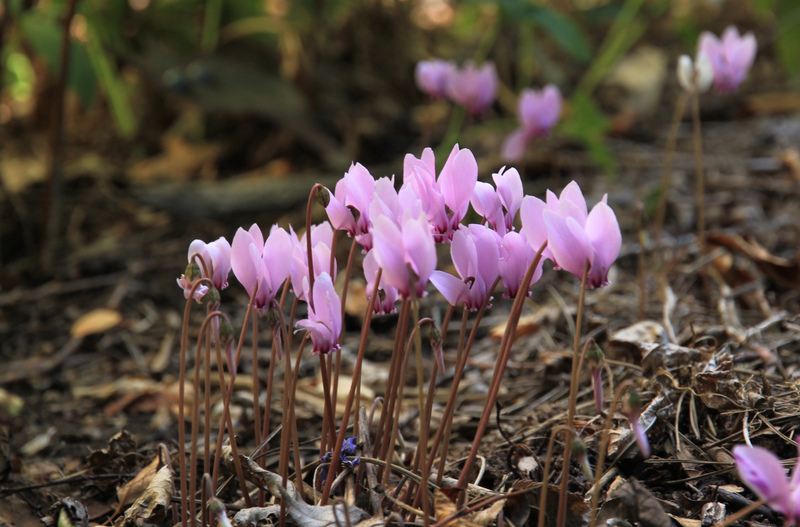 This is Cyclamen hederifolium. The guy I live with says we’ve never been much into watering, though back in the days when the Long Border and the Great Lawn were all lush and green there was a lot of watering to be done, but he says that that’s sort of weird, watering so you can have a different kind of garden. He also says that watering to make up for the “normal” rain that didn’t fall is something different, and so that’s why he’s doing that. There are a lot more cyclamens to come, in the shade garden, by the way. Most of the Cyclamen hederifolium here have white flowers. You can see one of them in the background. The guy I live with, who has a tendency to lose interest in things (like he buys plants and then wonders why he did), said a while back that he’d lost interest in having a “summer garden” when we get about zero inches of rain, and so everything here has been pretty much super-crispy for months now. There are plenty of watered gardens to look at, around town, if he feels like doing that. On the other hand, and here I should assure you that the world, once again, is really not coming to an end, the guy I live with is talking about growing a whole bunch of vegetables and stuff in his friend’s yard. For a change of perspective, he says. I don’t really like vegetables. 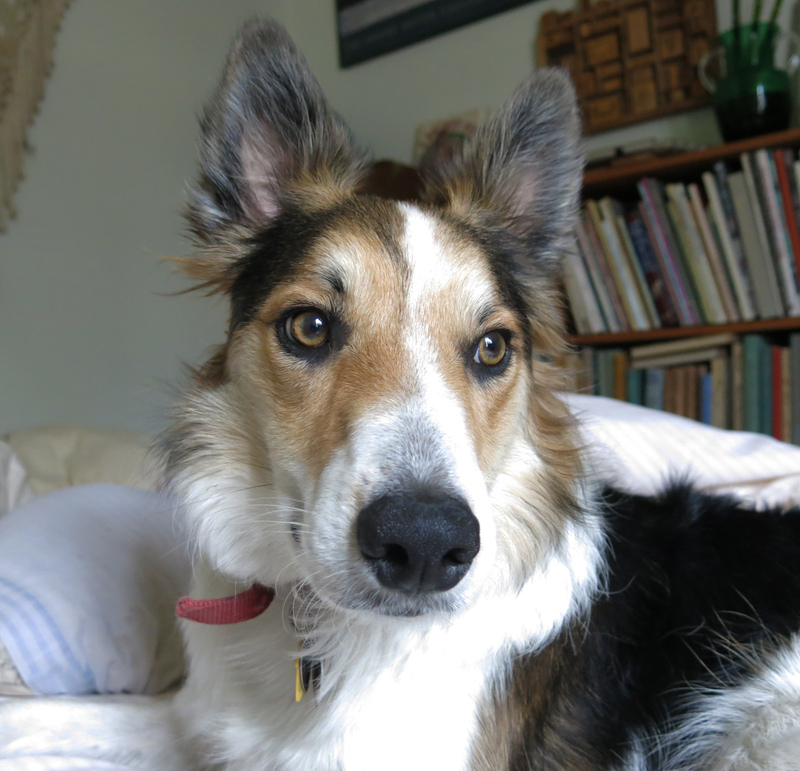 The guy I live with says that Flurry, the first purebred border collie who lived here, like to go into the vegetable garden (yes, there was one of those here, way back when), and pick his own Swiss chard, as well as strawberries and raspberries. I do like fruit, though. So, the cyclamen and colchicums are flowering. And it’s sort of raining. Not really raining, the way it does in some places (so I hear). We did quite a bit of gardening today and I’m fairly exhausted because of it. Plants were planted, plants were moved, there was some weeding, and so on. Some things needed to be barked at. And it’s still raining. Not pouring, more like sprinkling. 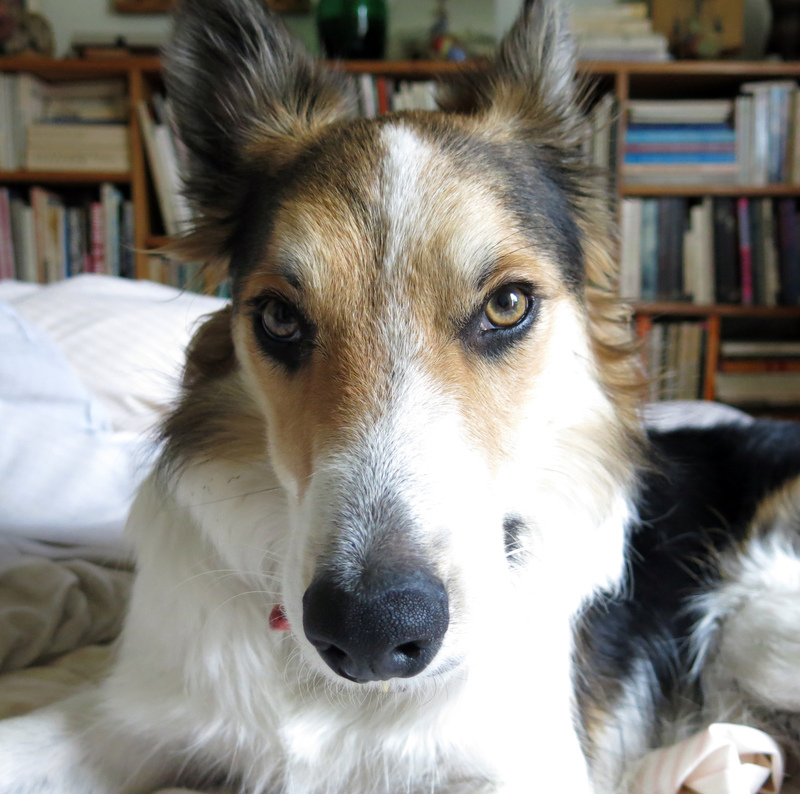 I forgot to say that the weather has suddenly gotten much cooler, and, for a purebred border collie like me, that’s just completely excellent. And now, I have a movie for you. I’m sorry that it doesn’t feature me, which would have made it totally superior, of course, but late last night, while the crickets were chirping, there were coyotes. If you were wondering about the title of today’s post, maybe this will explain it. I guess that’s it for today. I hope I didn’t scare you too much. Maybe if you blow really, really hard some of that rain will come back here and water my garden. We could do that, but it wasn’t enough rain to water the garden, just to scent the air with the fragrance of rain, and do a little bit of that petrichor thing. Disappointing, but in its own insignificant way, rather nice. Petrichor. I had to look that one up. The movie sounds so beautiful in an eerie way. What time was it? You can’t hear any cars or anything. Around here you are lucky to go 10 seconds without hearing something with a motor. Has TGYLW ever ordered Cyclamen seeds from Jan Bravenbouer? They have a bunch of interesting seeds and there is nothing much better than Cyclamen in my opinion. I would have a tough time not watering. To me a cultivated garden is a different kind of thing, so I water. It’s becoming even hotter and dryer in the summer here so we are gradually changing our plant selections. If you are considering blackberries I could not recommend “Triple Crown” enough. It’s thornless and tastes like blackberry candy with a touch of blackberry soda pop. And Mani, that second picture, coy with a touch of (may I say it?) steamy? sultry? Uh oh, I guess I’m outside the law. I got some from England with no permit. I’ll have to check into that. Thanks. You know, if the only reason the Internet came into being was so we could listen to crickets and coyotes in Mani’s garden, it would be enough. Thank you. You’re welcome, and thanks. It was pretty scary. Super scary! You could play that loop for Halloween. Yeah, we might. Though we could have scarier things before then. Ah, the sound of cricket and distant coyote after a bit of sprinkle does make one sleepy, as evidenced by your last portrait, Mani. 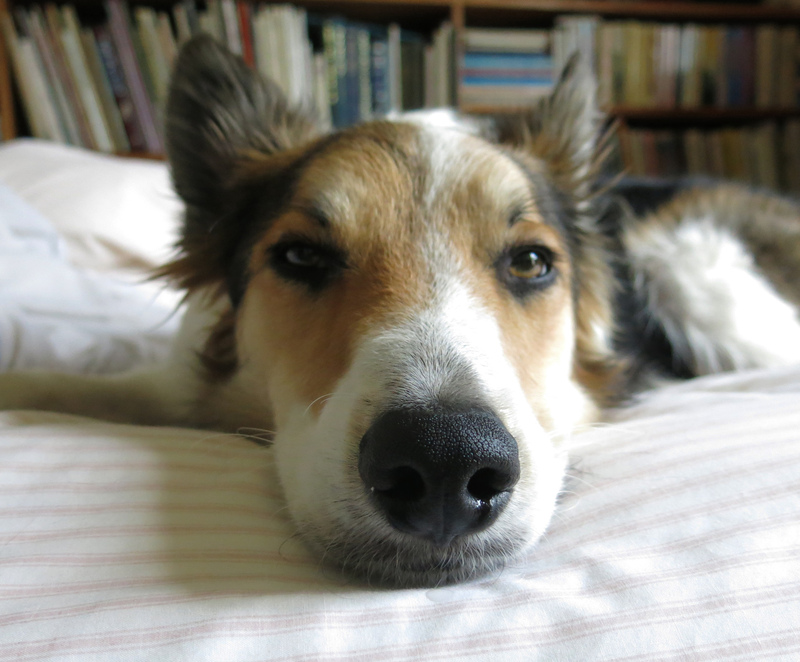 Even your first two photos display a lack of biscuit-on-head artifice and show a more relaxed dog. I am puzzled by the lack of bark noise on the soundtrack, though. I didn’t think a purebred border collie could be that relaxed in the presence of coyote, no matter how distant. Probably all the gardening work had tired you out. 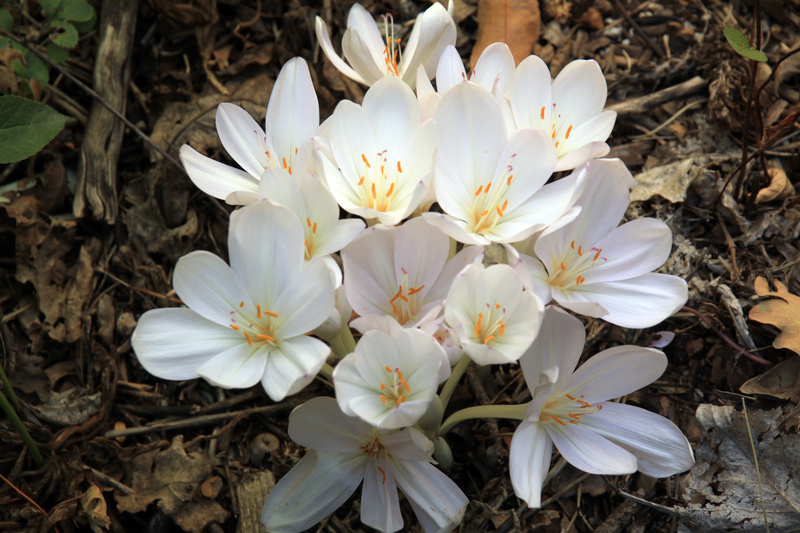 The plant photos are gorgeous, especially Colchicum byzantinum ‘Innocence.’ If a bit of water is what it takes to bloom such beauty, hose on. Thanks; the guy I live with plans to water a lot in the next few weeks. Maybe. Water here is ridiculously cheap, but he thinks it’s weird to use all that treated drinking water. Maybe we’ll just be weird here. I’m not sure why I didn’t have anything to say about the coyotes; maybe I was too petrified. We haven’t heard them here very much, lately. It rained here twice today. The guy I live with got all excited, and then the rain stopped. He sighed. There’s a lot of sighing around here, these days. The weather site said that there were only four sunny days last August, and we, being on the west side of town, probably didn’t even get that many days with sun all day. Now it’s September and still gloomy, with no rain. Only sighs. Mani, you might be the most handsome dog ever. And I always enjoy your cyclamen. Thanks for sharing. Thanks. What a compliment. It might go to my head, you know. The cyclamen are pretty wonderful. The guy I live with planted all the C. hederifolium, in the shade garden on the north side of the house. And now it seems that they’re seeding around, a little bit, but nothing like the C. coum do in the rock garden.